Ana Julaton: Back in the ring on May 4, fighting Yolanda Segura! Ana “The Hurricane” Julaton went the distance with Yolanda Segura, taking a ten-round decision in what has been described as a one-sided fight with Julaton boxing at will from about the fifth round on. Segura, who weighed in four pounds over the contracted weight was fined 25% of her earnings. GMA News has the full story here. The measure of a true champion is her willingness to fight back from adversity. Ana “The Hurricane” Julaton is proving herself to be just such a champion by stepping into the ring on May 4th, her first step towards winning another championship belt after her devastating loss in March. Ana Julatan’s (10-3-1, 1-KO) first comeback bout will be this coming Friday, May 4th in Kanasin, Yucatan, Mexico where she will fight a ten-rounder against the up-and-coming Mexican fighter, Yolanda “La Negra” Segura (8-3, 7-KOs). 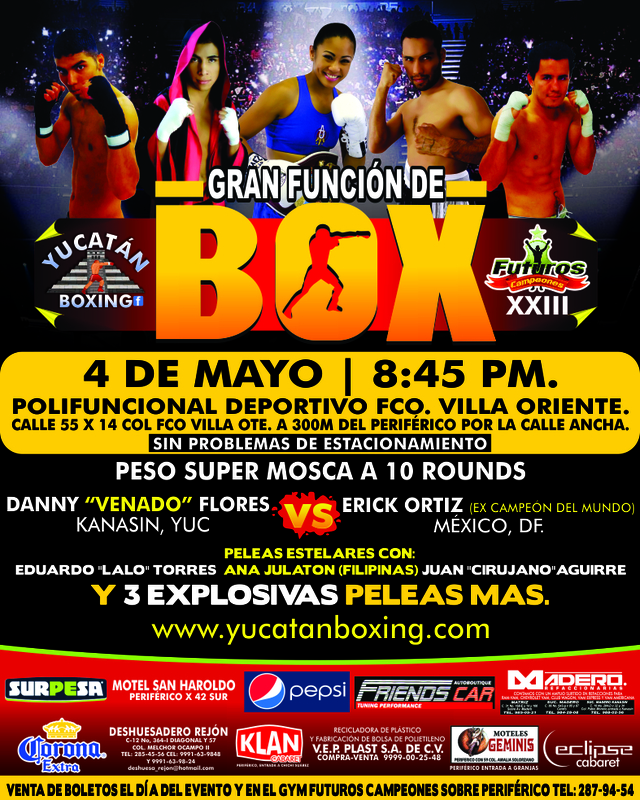 The fight is being promoted by Orion Sports Management in partnership with Yucatan Boxing. It will also be broadcast to millions of Julaton’s fight fans in the Philippines on the GMA network. Julaton’s drive and determination have led her to a vigorous training schedule and a return to the fundamentals that have made her a great fighter. She is also jumping back into the ring a mere six weeks after her loss. That says a lot about her character and to my mind, we can all expect great things from her as she fights her way towards another shot at a title. Ana Julaton’s team has put together a promotional video ahead of her fight – note some of the narration is in Filipino. The following is the full fight of Ana Julaton’s battle against Yesica Patricia Marcos. It’ll be interesting to see how Julaton changes her game plan in her fight against Segura this Friday. « Frida Wallberg v. Amanda Serrano Fight!